Businesses are now switching to providing customer service using IMs such as WhatsApp and Hike. Users too these days value a relationship that is interactive, responsible and spontaneous. Customer service using WhatsApp or Hike has thus become the most preferred choice for any new or old business. With 1 billion users, WhatsApp has opened up a new channel of communication for businesses. From voice calling to sending images, videos and other media files to most of the mobile devices such as Android, iOS, Windows and Blackberry. Many businesses were initially reluctant to use instant messengers for customer service due to their inability to organize chat messages efficiently. However, a business cannot ignore the fact that WhatsApp allows speedy interaction required to solve queries and answer customer questions instantly. While WhatsApp and Hike allows you to save, backup, email and favorite chat messages, businesses always looked for a way to organize chat messages using labels, filters and quick search. Analysing chat messages from team and customers and creating reports was always a dream of a team leader or manager. 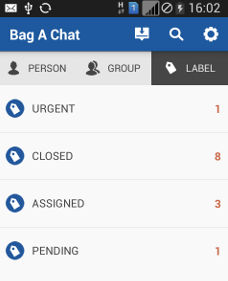 Bag A Chat app overcomes this challenge by allowing you to organize chat messages by way of creating labels. You can name the labels as per your choice and save chat messages under them logically. For example: If you want to group all the chat messages related to new orders. You can create a label named as New Orders and save chat messages under this label. So, later on, you can simply go to this folder and review all the new order enquiries without getting lost in all the chat messages together. You can also forward/assign messages to team members along with all details of messages like the timestamp and sender of the message. So a complete track of information is available to team easily. Other benefits that you can leverage are creating analytical reports based on WhatsApp chat messages, set reminders or alerts to chat messages and selectively save or cloud backup your customer service chat messages. With a easy to use interface and brilliant features of Bag A Chat app, the entire customer support team can provide long lasting and improved customer support to thousands of customers in real time. Bag A Chat app can also be customized and integrated with your business CRMs and customer support helpdesk systems like freshdesk, zendesk for better management. See more details here - Bag A Chat app for Customer Service Using WhatsApp and Hike.